The new Chevy Cruze Diesel has officially been rated by the Environmental Protection Agency (EPA) as offering 46 miles per gallon on the highway. 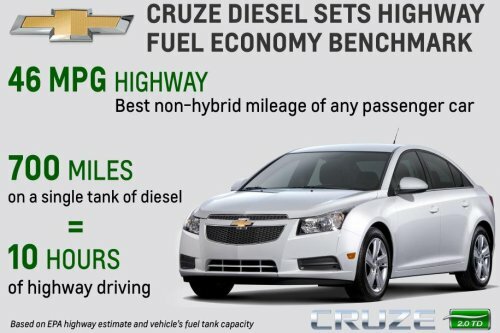 That figure makes the Cruze Diesel the most efficient non-hybrid car in the US market with only the Toyota Prius Hybrid (48mpg), Volkswagen Jetta Hybrid (48mpg) and Ford CMax Hybrid (47mpg) offering better highway fuel economy than the oil burning Cruze. With a highway capacity of 46 mpg, the Cruze Diesel actually beats a handful of hybrids including the Toyota Prius C and the Honda Insight while soundly beating the closest diesel powered competitors in the form of the 42mpg Jetta TDI and the much smaller 41mpg VW Golf TDI. In addition to being able to brag about driving one of the most efficient cars in America, drivers of the 2014 Chevrolet Cruze Diesel will boast an estimated 700 mile highway driving range on a single tank of gas. Neither GM nor the EPA have announced the fuel economy figures for the Cruze Diesel in the city or overall average (combined) but once those numbers surface, we would expect that this new diesel drivetrain will not disappoint. The keystone of the 2014 Chevrolet Cruze Diesel is, of course, the new turbocharged 2.0L diesel engine which is coupled with a 6-speed automatic transmission. This drivetrain provides 148 horsepower and 258lb-ft of torque along with an overboost feature that temporarily kicks up the torque to 280lb-ft so not only is the Cruze Diesel the most efficient non-hybrid in the segment – it is also one of the most powerful. GM claims that the Cruze Diesel will dash from a stop to 60 miles per hour in 8.6 seconds. The Chevrolet Cruze Diesel will carry a starting price of $25,695 and that includes an $810 destination charge so this new package is the most expensive option in the Cruze lineup but it is priced very similarly to the most fuel efficient and bestselling hybrids in America. That price is a touch higher than the $24,995 base price of the Toyota Prius (which includes destination) but if you go just one step up to the “Prius Three” trimline, the price of the super efficient Toyota hatchback jumps to $26,560. The Jetta Hybrid starts at $25,595 so it also has a very small advantage in base pricing while the Ford CMax Hybrid starts with a price a touch higher than the base Cruze Diesel at $25,745. In short, the Cruze Diesel might be the most expensive trimline in the Cruze lineup but it offers both fuel economy and pricing similar to the market’s most popular hybrids while offering a ton more power. Details on the 2014 Chevrolet Cruze Diesel have not been fully announced yet but we do know that the $25,695 base price includes unique 17 inch aluminum wheels, the MyLink infotainment system and leather seats – features not offered in the base versions of the Prius, CMax, Jetta Hybrid or Jetta Diesel. In some cases, leather seats arent offered at all in the sedans that compete with the Cruze Diesel in terms of fuel economy so for a driver who wants a plush interior in a vehicle that offers incredible highway fuel economy – the Cruze Diesel might be a popular choice. The German automakers have long offered diesel passenger cars here in the United States but American automakers have avoided diesel engines in vehicles other than pickup trucks. However, the misconception that all diesel engines are noisy, soot-spewing mills has slowly faded with the growth of clean diesel technology so the Cruze Diesel could be the start of a new trend towards diesel cars here in the US. Should the Cruze Diesel succeed, I would fully expect to see more American cars with a diesel power engine – specifically from the Chrysler Group. Parent company Fiat SpA favors the use of clean diesel tech over in Europe and company boss Sergio Marchionne has shown a preference for diesels over hybrid or EV models. There are already rumors of a diesel powered Chrysler 300 that will use the same EcoDiesel V6 as the new Ram 1500 and Jeep Grand Cherokee and the early success of the Cruze Diesel could play a big part in the future of diesel vehicles for the Chrysler Group.